English Speaking Guide or monitor is included during all the tour except during the boat trip on the canyon. Combine visits to Sumidero Canyon and the Magic Chiapa de Corzo on this adventure from San Cristobal de las Casas. 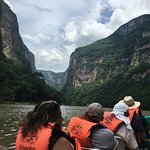 With your guide pointing out the flora and fauna, take a boat ride through the canyon on the Grijalva River, admiring in the towering canyon walls around you. Stop next at the Magic Town (Pueblo Magico) Chiapa de Corzo, where a walking tour will take you to the city's central fountain, formed of mudejar-style brickwork. Entrance fees and round-trip transportation included. Your tour begins with hotel pickup in San Cristobal de las Casas. 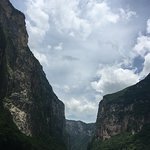 Drive to Sumidero Canyon and begin your 2-hour boat ride along this majestic canyon. Admire the walls towering 2,500 feel above you and also see amazing waterfalls, caves and even spot monkeys, birds and crocodiles. Once you are done with the ride, you'll board your vehicle and drive to the Magic town (Pueblo Magico) of Chiapa de Corzo. This colonial city was founded by Spanish conquistadores. You'l'l enjoy a 2-hour visit here and have time to explore the town, walk around and, if you wish, enjoy a typical dish of the region. See the city's central fountain to admire the outstanding mudejar-style brickwork and surroundings such as the portals with colorful crafts for sale. After your visit, relax on your trip back to your hotel. 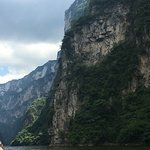 It's a beautiful canyon and more accessible than many of the other sites in the area, the boats move fast and the trip is well worth it, the aqua-oxxo stop at the deepest part of the trip is probably the only down side. 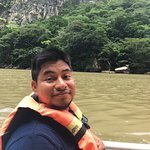 Get quick answers from Sumidero Canyon, Chiapa de Corzo Magical Town from San Cristobal de las Casas staff and past visitors.